The highest point in the district is St. George’s Church, with the ground sloping away rapidly to the north and west. The ridge on which the village stands extends to Low Hill and Edge Hill, and the foot of the ridge is the western boundary of the township. The centre of the old village is, unsurprisingly, Village Street. There was a mere, later known as St. Domingo’s Pit, which was just below the Beacon, and which Mere Lane led down to. At the beginning of the 20th Century Moss Lake Brook flowed towards the town centre from Everton. The main route east out of the city of Liverpool was once the road along Everton Brow, the old name of which was Causeway Lane. Halfway up the slope to the west of Everton Netherfield Lane turns to the north, with a branch leading up the hill. From the top of the village, this road led north to Everton Beacon (demolished in 1803). The road then divided, running downhill to Kirkdale and Anfield. In the fork of these two roads stood St. Domingo’s House. The roads remain as Heyworth Street and Everton Road. After passing through the village, the road from Liverpool divides into Breck Lane, leading to Walton Breck, and another road, which again divides into roads to Newsham and West Derby respectively. Everton was one of the first areas of Liverpool popular with rich merchants who traded through the city. However, later chemical works and riverside industries arrived, and the large mansions were knocked down, and replaced with hundreds of terraces. The roads were then widened along the main routes, and tramways were serving the district by the 19th Century. As the main centre of the city decreased in population in the 18th and 19th Centuries, Everton was one of the areas which gained population in its stead. This trend was most apparent in the early 19th Century, but in Everton the pattern reversed towards 1900. Although no longer the area for the rich merchants, Everton attracted master mariners as well as working families. As the 20th Century continued, Everton became infamous for cramped and squalid slums. Hundreds of houses were bulldozed, here and in other areas, and were replaced by equally infamous high-rise flats such as the Piggeries in Everton Park. A large sandstone quarry occupied the northern slope of Everton Brow. An old pumphouse, or bridewell, was built above the village in 1787, and was still standing in 1907. Until 1820 the shaft of a market cross stood in the open area in the middle of the village, with a sundial fixed to it. There was also a holy well in the area, but the exact location of this has been lost. Everton Beacon was a sandstone tower of two storeys, roughly 20 foot square. During Napoleonic times it was used as a semaphore station. The Necropolis, an enclosed burial ground for Non-Conformists, is now a public garden. There was also once an open space, triangular in shape, known as Whitley Gardens, on the corner of Shaw Street and Brunswick Road. Everton was incorporated into Liverpool in 1835. 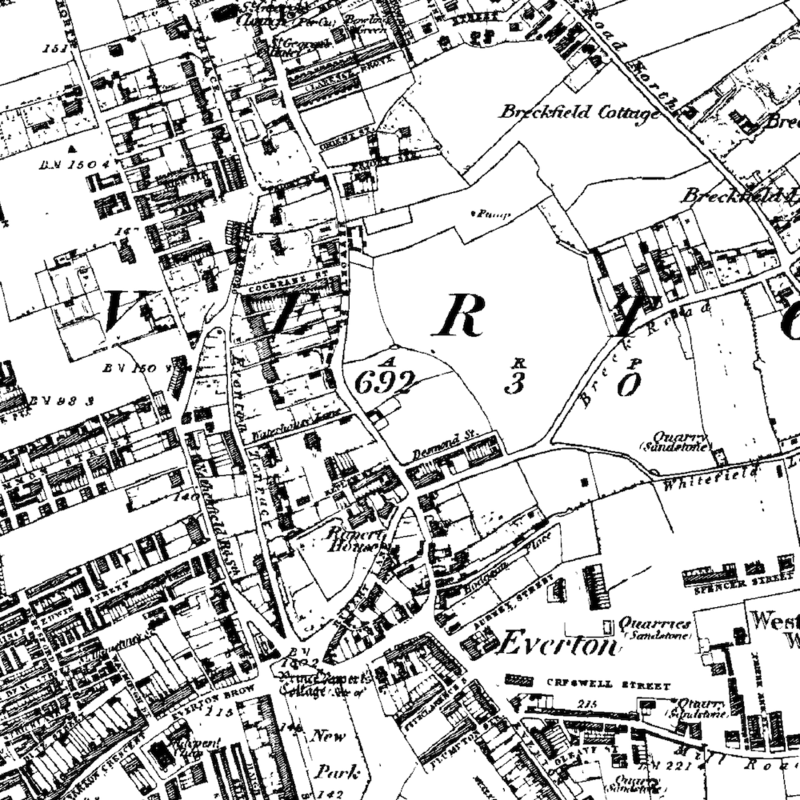 Extract from the 1851 Ordnance Survey map showing Everton on the outskirts of Liverpool. Land to the east is rural. In the middle of the 19th Century Everton was only heavily built up to the west of Netherfield Road. The village of Everton (located at Village Street and Brow Side) was still just about discernable from the rest of the area even as the city of Liverpool encroached from the west. New Park was marked on the 1851 Ordnance Survey map to the south of the village centre, and ‘Prince Rupert’s Cottage’ was identified. The ‘Cottage’ sat in the middle of the village green, which was stood alone in the middle of the incoming roads: Rupert Lane, Netherfield Road South, Everton Terrace and Everton Brow. Rupert House, a building commemorating the royal visit of Prince Rupert in 1644, is also marked. Most of the township at this time was covered in large villas with back gardens or yards. These were the dwellings of the wealthy businessmen who saw moved out of the dirty city to places like Everton, Toxteth Park and Kirkdale in the 18th Century. Along with the houses a large number of sandstone quarries are marked. These are only small and the stone for them would have been used only locally. An area to the north east of Everton village was St. Domingo. This centres around the Church of St Domingo and also Mere Bank, a large house. St. Domingo’s Pit is also identified on the map, and the area is surrounded with the large merchant houses already mentioned. The pit was a shallow lake, or mere, from which the house no doubt got its name, along with Mere Lane which led down to the lake. The two largest features on the map are the West Derby Union Workhouse which stood at the end of Mill Road in the east of the township, and the Zoological Gardens (complete with fireworks department!) just to the south east of this. Finally, at the very south end of the township was the Liverpool Collegiate Institute on Shaw Street (now converted into flats) and the already dense areas making up Kensington. The next Ordnance Survey map to be published of the area was in 1894. These forty years were some of the most crucial for Liverpool, and saw the almost complete transformation of the township of Everton. Little remained from previous years save for the main roads and Rupert’s Tower. A massive number of terraced houses had been built for the influx of people coming to find a job. Everton in particular was an area populated by Irish migrants; a high proportion of those who settled in this township were Roman Catholic. These terraces now appear to cover the entire area of the 1894 map. One of the largest gaps in this swathe of housing was the first building of the Notre Dame Catholic College. The grounds of Rupert House (known to have been standing in 1830) by this time had a militia barracks built upon them. While this was a very important period in world history (with the Great War and a recession) Everton does not appear to have changed much on the map. The area was still covered in dense terrace houses and courts. Churches dotted the landscape and small industrial works can be made out. The feature marked as ‘New Haymarket’ on earlier maps is now a covered market on the newly lengthened and straightened Cazneau Street. By 1930 the militia barracks had been turned into a recreation ground. Soon after the end of the Second World War Britain was entered a boom time. Attempts were being made to expand Liverpool’s industry from dock working to manufacturing, and new plants like those at Speke and Aintree were the result of this. Alongside the new factories, edge-of-town suburbs were springing up to rehouse those who had been, until then, still living in the cramped Victorian streets. 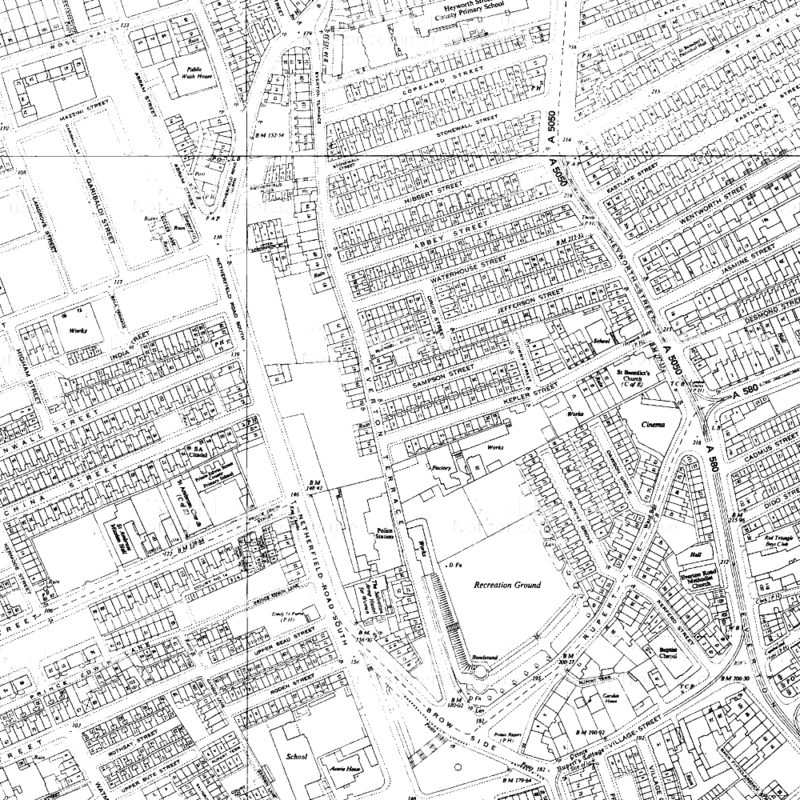 During the 1950s and 60s these streets in Everton were to be demolished, but on the 1910 and 1930 maps there was no evidence of this was coming change. Although Everton was still generally a gridiron mass of roads and houses, the main arterial roads into the city had changed massively by the mid-1960s. Scotland Road, Great Homer Street and Byrom Street had been widened and straightened, and a spiral junction had been built to take traffic into the Kingsway Tunnel. Holes were beginning to appear in the fabric of Everton housing between Netherfield Road and Great Homer Street, north of Roscommon Street and where Campion Catholic High School now stands. By 1978 the clearances were almost complete (although the rebuilding was far from so). 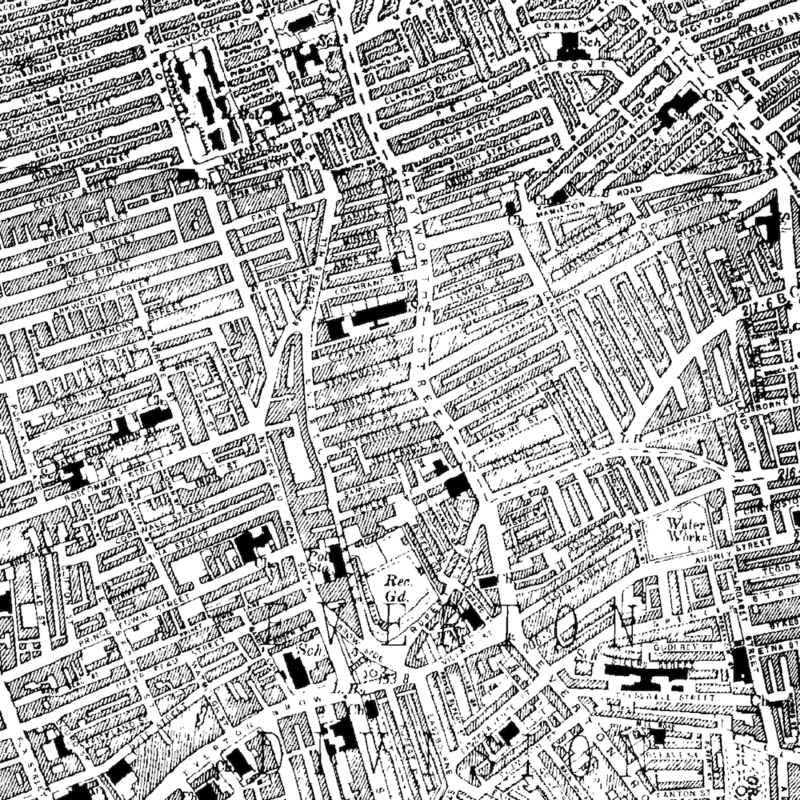 The space now occupied by Rupert Recreation Ground and Whitley Gardens had been cleared, but the roads were still marked on the Ordnance Survey map as rather sad dotted lines (a mirror image of when this was done on Victorian maps to denote streets in the process of being built). These large areas were later to be redeveloped as Everton Park. The transformation of Everton from its state in 1984 had now been completed. Almost all the small, straight side roads had disappeared, or been cut short and reshaped. Roads which once existed as part of the characteristic grid pattern can still be seen, but they are either dead ends or curved cul-de-sacs: Fitzclarence Street, Cochrane Street, Beau Street and Upper Beau Street are all roads marked on the 1894 map but which would be unrecognisable to their Victorian residents. Everton was one of the first townships to see an influx of rich residents in the 18th and 19th Centuries. It was also one of the first to be overrun with masses of Victorian terraces which housed the dockworkers for which the city was famous. As dock work became scarce, and well-meaning councils cleared the ‘slum housing’ after the Second World War, Everton was one of the many places where the heart was ripped out of the community and shipped the city outskirts. While it remains one of the most deprived parts of Liverpool, it has been redeveloped with masses of green space, and still enjoys the lofty view over the city centre it was noted for in the Victoria County History. Everton has been buffeted on the winds of change sweeping across Liverpool. How it fairs in the future will be just as dependent on Liverpool’s fortunes as it ever was. your article mentions irish ‘immigrants’ in liverpool. the irish were actually british citizens as ireland was part of britain and they were coming to their own country when they arrived in liverpool. Thanks for your comment. You’re absolutely right – Ireland was part of Great Britain until 1921, and so the people coming over to Liverpool were not ‘immigrants’ by the strict definition of that word. I’ve changed it in this article to ‘migrant’, which can refer to someone who goes “from one country, region, or place to another” (Dictionary.com) and so includes movement within a country. I’ve also updated the History of Toxteth article, which referred to people moving from Staffordshire as ‘immigrants’! Thanks again for the tip-off. Hope the site has been useful and/or interesting for you. 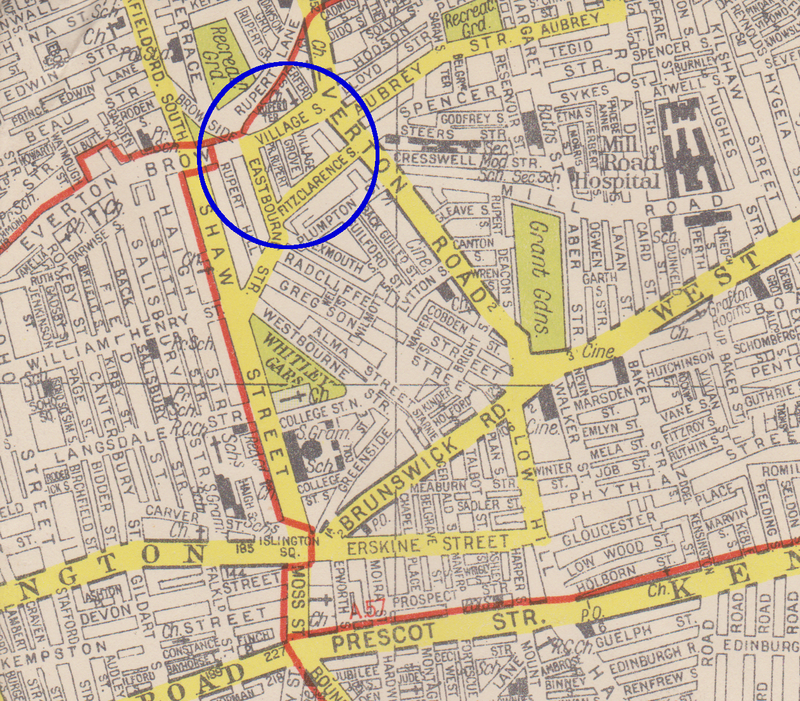 Do you know how I would go about finding an old map of where my Great Grandfather used to live in Everton ? I believe the house/mansion? was called Ashleigh and it was on Walton Breck road. It’s funny you should ask this now, as I’ve just read a book about Anfield and Breckfield (Ordinary Landscapes, Special Places, by Adam Menuge) which mentions Ash Leigh (which was technically in Anfield). Ash Leigh was a cul-de-sac which had five very large semi-detached villas on it, plus a couple of other large houses. These were inhabited by some of the wealthier Liverpudlians in the 19th century (In the 1851 census three of the inhabitants were Polish, German and Prussian merchants respectively), so perhaps your Great Grandfather was a business owner or merchant? You can see the location of Ash Leigh on Google Maps: http://bit.ly/pXrdPX – draw an imaginary line between the end of Oban Road on the right and the right hand corner of Oakfield (the square road on the left). To see old maps of the area, go to http://www.old-maps.co.uk, find the ‘coords’ boxes on the home page, and type 336715 in the first and 392705 in the second, then press ‘Go’. There is a list of maps down the right hand side – click on the second one down and wait for it to load a larger version in the main pane, and then click on the big version to zoom in once. You should just be able to make out the isolated cul-de-sac next to the words Monckton Lodge. Clicking on the fourth map down (1851) will show you a much more zoomed-in map (scale 1:500), taken from a time when the area was much more built-up. You can buy copies of these maps by clicking on the Add to Cart buttons next to the relevant map (note, I’ve no connection with Old Maps and have not used the buying service, so can’t vouch for them personally). And just another short note. If you get hold of the Ordinary Landscapes book, Ash Leigh is discussed at some length (with an extract from the 1:500 1851 map) on pages 18-20. Happy to let you know we just came back from England visiting many Beyer family relatives, from London, to Guildford, Liverpool to Chester/Christleton ( they had all passed ). While in Liverpool we went to Rumford Place where G.G. Grandpa Gottlieb Beyer and his son each had their own office Gottlieb was in the Insurance business and Thomas Ernst was in Cotton. We also went to Ashleigh in Anfield but the family house had been long torn down. That’s great! I’m so glad this site helped you ground some personal family history in the landscape. Hi Martin, I just found your reply … one year later ! Yes this is the place, My Great Great Grandfather was the Prussian you speak of. His name was Gottlieb Ferdinand Beyer, and he was born in 1814. Gottlieb came from Preussisch Stargardt near Dantzig in Prussia he was listed as a Merchant” Preussisch Stargardt translated means Prussian Stargard, which is now Starogard Gdanski in Poland. So exciting ! My husband and I are thinking about going to Gdanski in Poland next year … but I am uncertain if any records of my family still remain there or were they are shipped off to Berlin were the Prussian records are suppose to be. ? Thanks for your links this is just wonderful !~ Best Regards Alane. I’m trying to find some information about the history of buildings/properties in Fox Street Everton but not having much luck. I’m douing a resarch project for my university course. I appreciate if you know how to access them. Maps are probably a good first port of call, so http://old-maps.co.uk is a good place to start for old Ordnance Survey maps. You can search for the road name itself, and then the site gives you a list of maps on the right hand side which cover the area from 1850 onwards. 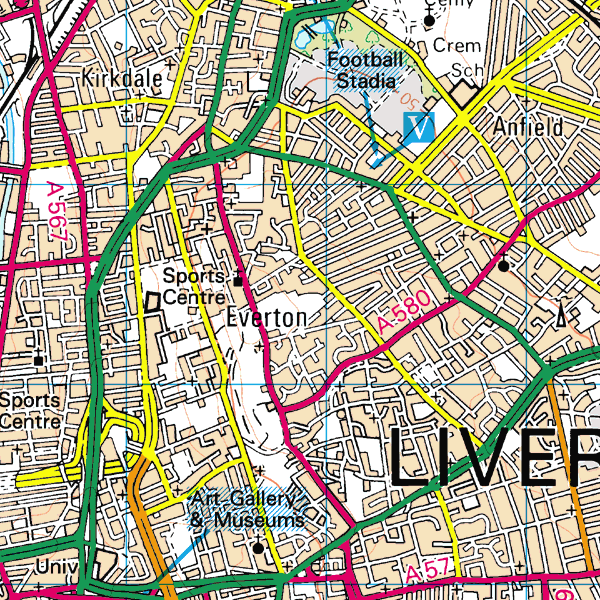 You can buy copies of the maps from Old Maps, but you can also view them at Record Offices (Liverpool and Lancashire both cover the area). Hope this starts you off on your research, but if there’s something specific I’ve not covered, do let me know. Visit our Forum, I’m sure we will be able to help with your questions. I am looking for any information on ‘The New Boys Home’ on Everton Road. My grand father appears on the 1901 Census as an inmate there and i would like to find out more about it. Why children went there? What the conditions were like? Who ran it and how was it funded? How and why the children came out? Are there any photographs of the building or children? Having had a look around, I see from this discussion (http://www.rootschat.com/forum/index.php/topic,239503.msg1323962.html#msg1323962) that there are photographs of the home in Liverpool Record Office. The discussion mentions that one of the bosses was a Thomas Clingan. For general information on workhouses, you can’t do much better than http://www.workhouses.org.uk/. There are links to further resources. I think these should answer most of your questions which might apply to all workhouses (such as conditions, funding and who went there). can anyone tell me if there were any houses on cochrane street in 1966? Cochrane Street was in a huge area of dense ‘grid-iron’ pattern streets from the 19th Century up until the mid 20th Century. The small portion left of this street now runs through Everton Park, with just the chapel left. The 1967 Ordnance Survey map shows the street still in existence (including the chapel) and is marked with grey areas denoting buildings. So I’d say it did still have houses on in 1966, although this was a period of rapid change, and so would welcome any eye witness accounts! See a map extract from Old-Maps.co.uk posted on the Historic Liverpool Facebook page. Not sure if these replies are read by the enquierers (enquirees?) anyway Cochrane Street was still full of houses when I left home in 1965. Thanks for adding some very useful information to the site. I know that quite a few enquirees read and even respond to messages here, so they’re definitely read! Im looking for photographes of the two blocks of flats that were situated on Netherfield Brow, can anyone help? They were two massive blocks from what I remember. Id love to see any pictures of them. any help would be most appreciated, thanks. There are a handful of photos of this area on the Orange Pages website. I think the blocks you are looking for are in the left hand photo on the 7th line down. Cochrane Street still existed in 1966, although they were starting to demolish parts of St Georges Hill around that time which Cochrane Street ran into. There are photo’s of the street available. The L5 site on facebook has a few which are easily accessible. Hope this helps. Steve Noonan (eyewitness, I was 11 at the time). Thanks for your comment. Do you have a link to the L5 site? Would love to see those photos you mention. Do you know exactly why Great Homer Street in particular was widened in the late 1960s? I am a member of the Duffy family whose shop was compulsorily purchased for this [I’m actually writing the history of the shop which existed in the area from 1907 till 1971] and I know the family was annoyed that they were forced to move but the site of the shop once demolished was used for the market [it was where the new NSPCC building is now on the corner of Rose Vale]. So, clearly the site was not needed for any road widening, whether for the new Wallasey tunnel or any other reason. I’d like to be accurate on this but am not sure how to find out. While it’s hard to pin down exact reasons why certain roads and areas were redeveloped, large areas of Everton (and elsewhere in the city) were cleared because the housing quality was deemed too low. While I’m aware that these decisions were not always agreed with, Liverpool in the 1960s was caught up in clearance fever after the Second World War destroyed many old buildings and presented an opportunity to redesign the whole city like never before. Great Homer Street, Scotland Road and the areas right over to Breckfield Road were redeveloped several times in the 20th century, in trying to deal with a housing problem (of quality and quantity). It’s likely that your family’s shop fell in an area destined for widespread redevelopment. You may (rightly) believe that your own house was in perfectly good condition, and many were, but these massive schemes were too ambitious to worry about such details. Many of my own ancestors homes in Everton (Back Roscommon Street) and Toxteth disappeared beneath both road widening and slum clearance, even though in some cases I believe the quality of houses was not consistently bad enough to warrant total destruction. The market was probably part of this, in all a giant redesign of Everton. You may find more information about the reasons for, and impacts of, the clearance of this area in Ken Rogers’ very popular book The Lost Tribe of Everton and Scottie Road. I’d be really interested to read the book you’re writing. Is this something you’ll be publishing widely? Trying to find Hibbert Street around 1880! Thanks for your kind comment – I’ll definitely correct that spelling, as I think you’re right! Hibbert Street was located where Everton Park now is, between Roscommon Street to the west and Stanfield Road to the east. My map of 1890 has road names on it, and the bigger version, centred on Hibbert Street, is here: http://historic-liverpool.co.uk/old-maps-of-liverpool/plan-of-liverpool-north-sheet-1890/#5/51.193/-26.279 The smaller version is available on the Old Maps of Liverpool page of this website, the ‘Plan of Liverpool – North Sheet (1890)‘. Enjoy the site, and good luck with your family history! Hibbert St. ran from Everton Terrace to Heyworth St.
Martin, Hibbert St. ran between Everton Terrace and Heyworth St.
Inacityliving is always a great source of photos of old Liverpool. They have a page showing photos of Elias Street at the junction with Great Homer Street. Go to that page and do a search in your browser (press Ctrl and F) for ‘elias’. There’s a few other photos from the same area on that page too. Hi Martin, what district do you think Gerard Crescent/Gardens was in? Not sure if this is what you were after, but those streets where Gerard Gardens were built are shown on an 1890 map as being in St Anne’s Street Ward. Let me know if this wasn’t what you meant. I’ve been tracing my family tree for a while now and have recently found out that my family also lived in 30 Cochrane Street for a long time, maybe your partners family and my family are connected? I’m not sure of the specifics of the demolished villa or its owner, but St Domingo Grove was built in about 1846, but had stalled in 1851. At this time the demand for large houses in Anfield / Everton was on the decline, because the middling and lower classes were moving in! The merchants were on their way out to West Derby or Childwall. Some more building took place on the Grove in the 1860s. In the years leading up to this time, Anfield had become one of the first new suburbs to be popular with merchants, bankers and diplomats after Liverpool’s expansion had gone beyond the likes of Kirkdale and Islington. The first houses to be built in Anfield (after the original village and farms) were all large houses like the one you mentioned. There’s a lot of good information about the changing landscape of Anfield and Breckfield in English Heritage’s book Ordinary Landscapes, Special Places, available in the Liverpool History Bookshop or on Amazon. Dear Martin, I have an item of interest that I would like to pass on to the Everton Local History Group. Do you have a contact number for them please ? I’ve not been able to find any contact details for them. Perhaps you can get in touch with St. George’s Church in Heyworth Street, where they had their first meeting in February. They may be in touch with the organiser. There’s some details for them on the A Church Near You website. I’ll try to find out the group’s details myself and post back if I find them. they meet at the WECC. Get in touch with Paula at WECC, Friary Centre (Old Faith School), Bute Street – 0151 282 0303. She surely can tell you more details. The History Group will be happy about new companions. a pub called the Cottage at the bottom of the street and Whitefield Terrace also ran into Dawber Street. Hi I lived on Dawber street with my family until it was demolished. Brian Taylor (known as Tinker) we were the last family to move out. I have just turned 70. If anyone here remembers me or wishes to share memories, please get untouched. Hi Brian we, as children lived in a couple of rooms in what used to be the pub with my dad Joe Balmer and my mum Elsie Balmer, my Grandma lived in the next street Pinder street Elsie ( Mary ) Campbell and my great Grandmother Mrs. Gray lived around the corner in Atwell Street. Sorry I did not see this, I forgot about this site. My dad Joe is okay, sadly my mum Elsie passed away in 1990 she had a stroke. She was only 53 then. I love thinking about the old areas and streets where we grew up. There’s a list here of lost pubs in Liverpool, of which the only one on Great Homer Street is the Lamplighter. Could this be the one you’re interested in? Hi does anyone have any photos of Grants Gardens?. I lived in Aber Street till about 1968 when my family moved to Cantril Farm. I drive past Grants Gardens quite often and remember the fun times i had as a kid playing on the swings, slide and merry go round. If anyone has any pics i would be most grateful. There’s a couple of good photos of Grants Gardens on the Liverpool Picturebook website, including one of the playground. Liverpool Picturebook is proving itself to be a great resource! Hope this is of interest to you. Thanks for your map of old Everton, Martin. My great-grandfather, John Henry Naylor lived at 13, Rupert Hill in 1891. I believe the building was the Labour Party Rooms and John Henry & his wife were caretakers. John Henry was also a City Councillor in the early part of the 20th century. Thanks for your kind comment, and your extra info on Rupert Hill! Interesting facts about John Henry as caretaker and Councillor. It may be that the Labour Party Rooms were actually in Everton Road, which does seem more likely actually. By the time he died in 1926, John Henry Naylor had moved from Rupert Hill to Everton Road. I don’t known if you know anywhere where I can find photos of where I was born which was Aubrey St which sadly no longer stands? There’s a photo of Aubrey Street on Flickr, taken in 1954, which might be of interest. I’ve also seen a reference to one of a pumping house, which is held by English Heritage in their Archive. The record, named “Water Works, Aubrey Street, Everton, Liverpool” is on the English Heritage Archives website. They’re normally happy to send you a decent quality photocopy for free, or a better copy at various prices. Hi Julie, saw your comment and I too am trying to research my Great Grandparents/ Grandparents newsagents shop on the corner of Heyworth Street, Everton. You had any luck yet yourself? Be fantastic if you could help in my research of Heyworth Street, Everton. My great grandparents and Grandparents ran a newsagents shop on the corner and I always thought my great Grandparents lived next door, although I have since found an old postcard with no. 23 addressed to them on it. The family name is Earlam. They definitely ran the shop during the second world war, upto I guess the mid 1950’s. Be great to find any history, photos etc if you can help or point me in the right direction. Many thanks. Sheila. Earlem’s Newsagent’s was on the corner of Jefferson St.and Heyworth St. I was in there many times from childhood to teen years! I remember Mr. and Mrs. Earlem, They had what I thought of as a ‘Lancashire’ accent. I also remember when a new couple had the shop, I think early 1960’s, the husband worked in the post office in Old Hall St. Sorry, I have used ‘e’ where it should be an ‘a’ in Earlam. Thanks for sharing your memories with us! Sound like fond recollections! Please forgive the time in answering. I am sorry that I haven’t read your answer till now. You have the right Earlam family! Thank you for telling me where on Heyworth Street it was as I can now research whether the building remains. They did indeed have a Lancashire accent, although they hailed from Frodsham/Runcorn (think my Great Grandparents had Lancashire connections, they ran the shop too). It’s so surreal to write to someone who remembers them! They moved to Melling Road Aintree at some point in the 1950’s. Hi Sheila, sorry for such a long delay in answering, haven’t checked this site until now. Everton was part of the massive clearance of Everton, Vauxhall and Kirkdale beginning in the 1960’s, our old neighbourhood is now part of a parkland, no old houses there. Heyworth St. still exists, one of the original buildings closest to Jefferson St. is the Thistle Pub, it is still standing, https://www.facebook.com/LiverpoolPicturebook/photos/a.386062364815363.96134.117209091700693/386066498148283/?type=3&theater&ifg=1 here is a link to a pic of the pub when all around was being demolished. Your grandparents shop was located somewhere between the pub and the church, the church was on the corner of Kepler St. which was the next street after Jefferson St.
My apologies for not replying until now and thanks for your comment. Kay has definitely got my Grandparents shop (see her comment above) and I wish I had seen her reply sooner. The Mr Earlam you mention, who was a vet, I don’t think has any connection to my family. But thank you anyway. My father was born and lived the early part of his life in Roscommon and Langrove Street around 1910 and I’m having some difficulty piecing together those times. Do you know where I could locate the history of the local schools of that area please? There’s a bit of information on certain schools in that area. The Liverpool Record Office has some records, as detailed on the Liverpool Genealogy website. Roscommon Street School gets a mention on the In A City Living site which has all sorts of great images on it. Were there any specific schools you were interested in? Have you any pictures of a block of flats just three story high! My family lived there on the top floor right along side the little Everton castle. Love to see a picture. Anyone know who the figures are on the Mere Bank pub? I am the landlady, and we are trying to get them restored accurately. I am looking for help with a photograph of my nanas’s house. It was on Walton breck road and was one of the house on the left hand side going down towards everton valley, that were demolished in the 1960’s. it just a grass patch now. My nanas’s name was Mary Chatterley and she had twin daughters May and Lilian. If anyone can help with this I would be so very happy..
Hello, I wonder if you know of where or how I could get any pictures or information on Acacia House. It stood on the corner of Everton Brow and Shaw Street. We moved from there when I was eight years old. I know it was demolished some years ago,but have no way of finding out about it. Many thanks. I was wondering how Cazneau Street got its name as I have Liverpool ancestors named Cazneau. Cazneau Street was named after Mr. B. B. Cazneau, who laid out the street, and probably owned the land. He lived at the bottom of Islington. Hi Martin. Could you please help me? I`m looking for any information about my Dads family who lived at 43 Stanfield Road until it was demolished. The family name was Davies and later Earle. Any added information about my Grandad Davies who was employed by the Corporation Water Dept`until the late 1950`s would be helpful . Unfortunately I’m no family historian, so wouldn’t really know where to start on family research. I’m more knowledgeable about streets, buildings, maps etc, so if there’s anything specific you’re interested in just let me know. Martin – I wondered if you could give me any info on something in Everton. I was looking at my Dad’s Birth Certificate the other day and it shows that he was born at 12 Village Grove, Everton. Is this in existance any more ? My Dad was born in 1904. I’m new to this site as Martin will attest to – I love family research. If its not too late – & hopefully you still check in – I’ve just found your Grandfather Edward Davies living at 43 Stanfield Road, b.24 August 1888 – Occupation:Road’s Labourer working for the L/pool Corp.
His wife Alice b.18 March 1899 – her surname possibly Cooper married 1924. Ironically I have an Earle branch in my family tree so there could be a possibility there’s a closer connection! I apologise if this question is off-topic, but I’m trying to remember the name of a second-hand shop in this area where I bought a guitar in the early to mid 1970’s. As far as I can remember, it was located at or near the three-way junction of Scotland Rd, Stanley Rd and Kirkdale Rd. I’m almost sure it was on the right-hand side of Scottie Rd as you’re facing the town centre. Does anyone remember the name of this shop? My grandmother lived at 35 Everton Valley. Last name was Chapman first name Eva. Sisters were named Alice and Phyllis. Brothers were Fred, Edward and Sidney. just wondering if anyone had any pictures of the houses on everton road before they were demolished. I can remember going there in the 1970’s as a child. family members lived at 35 Everton Valley from the 1920’s to 1990’s. I moved to Canada in 1982 and haven’t been back since. Sorry for the delay, have only returned to the site in the last couple of days. I have given some more info with regard to Everton as a reply to your previous post. Pretty sure Prince Ruperts Cottage was never renamed Prince Ruperts Tower. The cottage was basically a house for living in, and the tower, which is still there was just a lock up for drunks or something.They were not on the same plot , although they were near each other. You’re right, Paul. I wrote this a while back and it looks like my knowledge was less than thorough. I’ve removed the reference to the renaming, and I shall make sure to correct the rest of the article when I get a chance. Just found this page today… and I love reading the history *and* all the posted comments. Wow, what an amazing family find! That’s great to hear that you solved that puzzle. If you’re ever looking for more history of Everton, the Lost Tribe of Everton website is good for discussions and fact-swapping. My gg uncle John Frithiof Lundstrom lived there with his wife Caroline Jane Maylor. Old homes replaced by new ones hence the request for photos , does anyone recognise the names, he was Finnish, a mariner he was living there in 1878. Sorry, I’ve not been able to find any photos of that street from the period you’re interested in. I’ve seen a couple with newer housing on from the 1980s, but I’ll keep an eye out! Hi, My Father grew up in the late 1940’s/early 50’s above a boarded up pub called the ‘Whitefield Hotel’ which was on whitefield Road, everton (number 24 he thinks). I cannot find any pictures of this anywhere – are you able to help as i have search many local sites. After a quick look I can’t find any photos at the moment, but if I do come across any I’ll be sure to share them! Hi there, I’m seeking info as to how my great grandfather George Bailey managed to own 10-houses (possibly more?) opposite the church in Horne St, Everton (off W. Derby Rd) This is peculiar as in the 1911 census he is shown as a married retired L/pool Police officer, living at 17 Whitefield Terrace, Everton with his only son George Reginald Bailey, a serving L/pool Police officer. My father George Eric Bailey, was born (1917) and lived in Horne St and can recall being sent to collect rents (on behalf of his g/father) from the neighbouring properties as a young lad. My father died in June this year aged 98, but even he did not know how his g/father had become a form of ‘property mogul’ whilst still a Police officer. His own father, George Reginald was orig. trained as a cabinet-maker but later joined L/pool Police like his father. Despite being awarde 2no. L/pool Shipwreck and Humane Society Silver-medals for bravery whilst in service, he was sacked, like many others after the 1919 famous L/pool Police strike. He then went back to his trade as a cabinet maker, eventually retiring (like his father) to the IOM. My own father after serving in WWII in the RAF was demobbed nr. Middlesbrough in ’46 and married locally , living on Teesside for the rest of his life. Hi there, I am looking to find some further information regarding a Moore relative. My great-great-grandparents (Edward Sherring and Annie Moore) married in 1881 at Sacred Heart. I have really struggled to trace the Moore line to Dublin (Annie was born there), however, the marriage record notes a Julia Moore living at 19 Heyworth Street in Everton at the time of the marriage. However, I cannot find any further information. Just wondered if anyone else knows anything that sounds familiar? Annie, at the time, lived at 14 Fielding Street and Edward was at 77 Eastbourne Street. Hi, Im seeking information about my g grandmother Mary Lake who lived in 302 Everton Road in 1891. That is, according to her son (my grandfather) Walter James Lake who attested into the Royal Warwickshire Regiment in 1891 and listed his mother as his next of kin and she lived at the above address. I have checked with 1891 and 1901 census to no avail. Did this street go up to that number, and apart from a census, how else would you find out who lived where. I can’t find out for certain, but it doesn’t look like Everton Road would have gone that high in 1891. It’s quite a short road and even today (with fewer houses on it) it only goes up to about 70 – 80. Could the census have been mis-transcribed, and said 30b or something like that? I might be wrong on the house numbers anyway, but it’s just an idea. Thank you for looking into my request and replying to me. The information regarding the address came from my grandfather’s army papers and is very clear with three numbers. I asked this question on another site many years ago and your answer is the same as the one that I received. That the street numbers did not go that high in 1891 and still don’t. Maybe there is another Everton Road somewhere in Lancashire with numbers that go that high.??? That’s definitely possible. There are a few Everton Roads on Google maps, though not in this area. Perhaps an Everton Road has disappeared, but I’ve not seen any on the small number of road listings I have (that’s not to say there never was another one). The other possibility is that the your ancestor lived in a building with dense numbering, e.g. flats and maisonettes. I’m not sure how you’d find this out without being able to focus your research more closely, but if I see anything on the map that suggests this I’ll post back here. The A580 is Everton Rd, still runs from the top of Brunswick Rd. to Breck Rd. as it was before the clearance of the 60’s and early 70’s. When I was growing up there were no flats or maisonettes on Everton Rd. However there were some quite large houses, possibly some let in flats . I was born in the area and left in 1965. Hi, I’m trying to find Church Place in Everton. My Great Grandfather lived at number 19 in the 1890s’ but I can’t find it on a map. 2. the Heyes family of 1600’s/1700’s early Everton recorded In many old ‘google books. I have descriptions of where the Heyes Everton manors were and records of the development involvement by George and Thomas Hayes. 3. then onto my family of poor William Heyes born approx 1805 (married in St Mary’s Walton on the Hill with very nice signature spelling of HEYES which later was always HAYES) very difficult finding anything on his origins. It is also kind of a reflection of the Rich to Poor residency of Everton through my own Heyes family of which I knew nothing about until I discovered my ggrandfather was a BHC from Liverpool Sheltering Home not an Irishman from Dublin. I have pages of research but if you know a researcher willing to assist me I would be grateful. The Lancs History forum pointed me to the old google books which was extremely informative. Thanks…love your site. Though the streets aren’t old, it’s still possible that they were named after the landowners, perhaps of the Heyes estates. This might make sense if the plots of land still hadn’t been purchased from the old owners. For that you’d have to see if you could find land deeds. I’m not a great expert on them, but I’m sure the Record Office could help, and perhaps someone on here could too. That would be brilliant, thanks! Nice! I wonder where it came from I felt some kind of connection right away but then I have been way deep into this line of Vikings to Norman de la Haye/Hais from Contenan to English power hungry elites to beheadings & rebel leaders. Then Sir Thomas Hayes Lord Mayor of London’s cousin moving a branch to Liverpool to swap property with the other movers and shakers and launching campaign to take over more lands across the seas. To me it’s like watching a sea of robber barons washing over Britain then the new world creating a lot of descendants carrying and passing on that karma. My own personal Genealogy is revealing the results of their decisions and actions when I switch over to my 14 yr old BHC ggrandfather and his three generations of poor Liverpool Heyes/Hayes. My great grandparents had no idea they had a common ancestor 300 years prior (prob so common) if I can find the link in the chain within this area between 1800 and 1550 and no false paternaties (again prob common). BTW one of the London publishers of Shakespeare’s folios was bookseller Thomas Hayes and have only been able to discover his son took over the biz nothing else on them. Curiously it was my grandmothers line back to 1600s Stratford that all of a sudden revealed Sir Thomas’s daughter which opened up this whole investigation. I have never had a family history unfold like this before in its magnitude they were mostly Cdn Irish descent fisherman. I really do encourage people to look into their DNA (Not talking about being tested Not a fan of giving it away) by combining genealogy and the historical events going on around our ancestors for a bigger cultural experience. Sorry Martin my passion gets away from me. I appreciate the personal assistance you and your site offer very much. I find British history forums are very helpful. Blimey, sounds like you have an excellent genealogy to look into! No wonder you’re so keen. 🙂 My ancestors are Irish on both sides if you look at about 3 generations ago, with branches coming in from Scotland and across northern and southern England. It’s mostly ‘ordinary’ folk (if there is such a thing) with a couple of interesting highlights. Best of luck with further research! 1716: Henrietta Maria daughter of the Earl of Derby leased to J Seacome of LP, H Halsall R Johnson and T HAYES of Everton 115 acres in Everton incl Hangfield Whitefield and Netherfield . In 1790 the whole of Locality 19,k was owned by widow Mrs Thomas Heyes a family with extensive possessions in old deeds maps etc. The name Heyes has become extinct in the township except for some of the juvenile descendants. The property went down to her niece’s husband John Pyke. Both Mr John Rowe and Mr Beezley married George Heyes’ daughters who were co-heriesses of their father’s estates including locality 19,i or Beacon-Hey. George Heyes owned approx 10 acres Mere C19i, Beacon A 2m & n, Hill-side A46 a, Widdowsons A 15q, Whitefield G, Sleepers Hill D15a, End Whitefield G 15m, /butter-holes G 15s, /rottome Honefield E 15c. 1737-38 Thomas Heyes was constable tax collector etc 1737-38, 1741-42. So looks like Beezley and Rowe inherited all the property down from Thomas to the grandaughters through George so the Heyes name daughtered out in the area except for some ‘junior members of the Heyes family’. One of them could have been my William Heyes father as he was born 1802-5 ish. So will attempt this Heyes family tree and look for this 1790 property map. I’m getting somewhere at least with this ‘middle’ timeline in my missing links. That’s great! Those Google Books are so useful for historical research. I’m glad you found out a little more about the Heyes line, and perhaps even found the place where the watercolour picture of the 1734 plaque comes from.